PLANET OF WHITAKER BANK BALLPARK (A Galaxy Far, Far Away) - The Lexington Legends swept the Kannapolis Intimidators in a doubleheader with an 8-2 victory in game one and 8-4 in game two. The Legends hold on to the top spot in the South Atlantic League and are now 65-51 overall and 28-20 in the second half. The Intimidators jumped out to an early lead in the top of the second inning. Tyler Frost lined a triple to the right field corner then scored on a groundout by Carlos Perez. The Legends answered in the bottom of the third inning. Sebastian Rivero and Marten Gasparini reached on back-to-back singles. Ricky Aracena then hit a groundball, but the Intimidators committed an error, scoring both Rivero and Gasparini. Aracena scored on an RBI single to left field by Cristian Perez and Lexington led 3-1. Perez scored the final run of the inning on an RBI single by MJ Melendez and the Legends led 4-1 after the third. Lexington continued to score in the bottom of the fourth inning. Rivero led off the inning with a double to left field then was joined on the base path when Gasparini drew a walk. Kyle Isbel then brought home Rivero with an RBI single to right field. Seuly Matias smacked a two-run single to left field and the Legends led 7-1. The Legends plated their final run in the bottom of the fifth inning. Rivero lined his third hit of the game to right field then moved to third on a single by Isbel. Rivero scored the eighth run of the game on a sacrifice fly by Perez. Kannapolis scored their final run in the top of the seventh inning. Tate Blackmon blasted a solo home run to left field, but the Legends were able to hold on to the 8-2 victory. Garrett Davila was awarded the win for the Legends, tossing 3.0 innings allowing one run on two hits while striking out four. Lexington's starter Jackson Kowar pitched 4.0 innings allowing just one run on one hit while walking one and striking out one. Yosmer Solorzano was given the loss pitching 3.1 innings allowing seven runs (five earned) on seven hits while walking two and striking out one. The Legends were first to strike in the bottom of the first inning in game two. Kyle Isbel lined a single to left field then scored on an RBI double by Pratto to right field. Pratto scored on an RBI hit by MJ Melendez and Lexington led 2-0. Kannapolis plated their first run in the top of the second inning. Craig Dedelow lined a leadoff double to right field then scored on a groundout by Frost and the Intimidators were on the board, 2-1. Lexington broke the game open in the bottom of the second inning. Cal Jones, Carlos Diaz, and Isbel loaded the bases with three straight singles. A base hit by Perez brought home Jones then Nick Pratto drew the bases loaded walk, bringing in Diaz. Matias popped up a sacrifice fly to centerfield and Lexington led 5-1. Melendez ripped a bases clearing triple off the right centerfield wall, and the Legends led 7-1 after the second. The Legends scored their final run of the game in the bottom of the fourth inning. Pratto lined a single up the middle then moved to third on a double by Matias. Melendez popped up a sacrifice fly to centerfield and Lexington led 8-1. Kannapolis scored their final runs with one swing of the bat in the top of the seventh inning. Dedelow reached on a double to right field then was joined on the base path when Tate Blackman drew a walk. Frost then belted a three-run homer to right field, but the Legends were able to hold on for the 8-4 victory. Daniel Lynch was awarded the win tossing 5.0 innings allowing one run on three hits while striking out seven. Drew Harrington was given the loss pitching 1.2 innings allowing seven runs on eight hits while walking one and striking out one. The Legends and Intimidators meet again tomorrow night for the series finale at 7:05 p.m. at Whitaker Bank Ballpark. 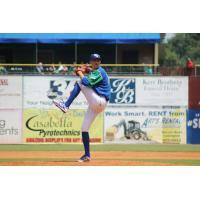 Lexington will send RHP Yefri Del Rosario (3-5, 4.42 ERA) to the mound and Kannapolis is TBD. Fathers and daughters can celebrate Daddy/Daughter Date Night on Princess Night at the Kingdom of Whitaker Bank Ballpark! Princesses will grace fans with their presence and are even available for an exclusive meet and greet! For only $17, fans will receive a box seat ticket, meal voucher, and the meet and greet. Members Heritage Credit Union customers will receive a free ticket by showing their card at the box office.